We recognize that your home is one of the most valuable things you own, so at Opendoor, we aim to give you a fair market offer. To get to your home value, our team of local real estate experts takes into account your home’s details and the most current market data. First, you tell us about your home—its unique features, upgrades, and condition. Then, we pair that information with an analysis of the local market conditions and recent nearby sales. To value your home, we start with a similar process to the one used by the best real estate professionals and then we add several additional steps to fine-tune our valuation for increased accuracy. In this article, we’ll walk you through how real estate professionals value your home and how we’ve built upon that process to calculate your offer. If you hire a real estate agent to sell your home, they’ll usually put together a report called a Comparative Market Analysis (CMA) to suggest a listing price. If your buyer gets a mortgage, their lender will also request an appraisal to confirm the value of your home. Whether it’s a CMA, an appraisal, or an Opendoor valuation, the basic process starts with the same two steps: finding comps and making adjustments. Feature Similarity: Choose homes that are the most similar to yours in terms of features like type of home (two-story vs. ranch), year built, number of bedrooms, bathrooms, and square footage. No two homes are exactly the same. Even if there’s a comp that has the same floor plan, is located next door, and built the same year, there will inevitably be differences in upkeep and upgrades. So, the next step is to make dollar value adjustments for these differences. To make adjustments, you take each comp and compare it feature-by-feature to your home. When there are differences in important features like square footage or the number of bedrooms, you’ll add or subtract the value of that difference from the comp. For example, let’s say your home has 3 bedrooms and Comp 1 only has 2. The goal is to find out how much Comp 1 would have sold for if it also had 3 bedrooms, so you’d add the value of an extra bedroom to the sale price of Comp 1. You’d continue making these dollar value adjustments for every major feature difference between your home and Comp 1. At the end, you’d sum up all the adjustments to get an “adjusted price” for Comp 1—this represents how much the comp would have sold for had it been more similar to your home. After getting the adjusted price for every comp, you’ll take a weighted average of the comps to get to your home’s value. 1. We assess the value of each home several times. When an agent or appraiser assess the value of your home, they’ll typically do it on their own and only once. Even if you’re getting a seasoned opinion from someone with local knowledge, they may have never valued a home with your specific floor plan or upgrades. Every individual’s valuation is limited by the set of houses they’ve valued in the past or seen on the market. At Opendoor, we want to decrease subjectivity in the valuation process. To do this, we make sure no home is valued by a single person. Instead, homes go through several rounds of valuation by our team of local real estate experts and our proprietary valuation model. Each round of valuations acts as a check on the others to ensure quality comps and adjustments. Our real estate experts value thousands of homes per week, so by combining their knowledge with all the data we have on recent sales, we have vast experience valuing all types of homes. 2. We fine-tune adjustments by analyzing hundreds of data points per home. Adjustments are one of the biggest areas of contention when valuing a home. How do you know the dollar value to add for an extra bedroom? What’s a mountain view worth? The worst way to do this is to use a standard adjustment—for example, adding $10,000 to any comp with a pool because you read somewhere that’s how much a pool is worth. Many real estate agents and appraisers will make adjustments by looking for pairs of homes that are very similar except for the feature in question. Let’s say an appraiser is valuing the extra bedroom in a 4 bedroom comp. In an ideal world, they would find two homes in the subdivision that sold at the same time and were exactly the same except one had 3 bedrooms and the other had 4. Then, they could just subtract and reasonably attribute the difference in sale value to the extra bedroom. The problem is it’s practically impossible to find such a match. Instead, they’ll often need to ballpark the value of the bedroom by comparing the sale prices of several 3 vs. 4 bedroom homes that also have other feature differences. 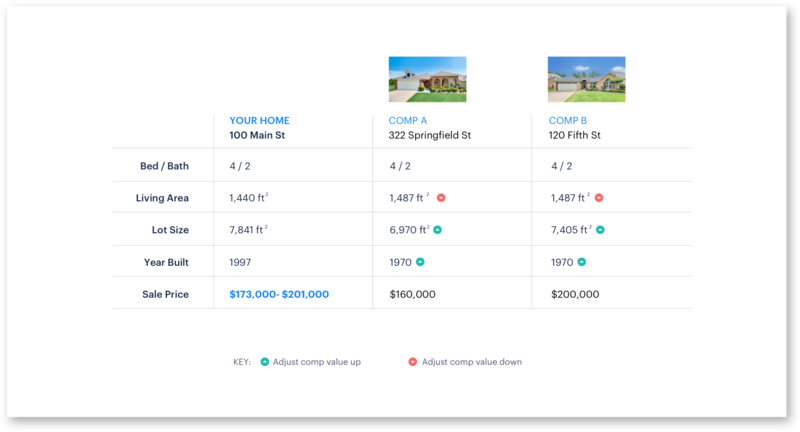 To get more precise adjustments, Opendoor has built a valuation algorithm that can compare hundreds of pairs of comps to value that bedroom. The algorithm allows us to more accurately assign a dollar value to each feature difference between your home and a comp. In addition, we give you the option to submit photos of your home and any upgrades you’ve made so we can make even more accurate adjustments. 3. We regularly review the accuracy of our valuations to look for ways to improve. According to the National Association of Realtors, 37% of homes listed on the market for 3-4 weeks drop their asking price at least once. Price drops are so common because accurately valuing a home isn’t easy. 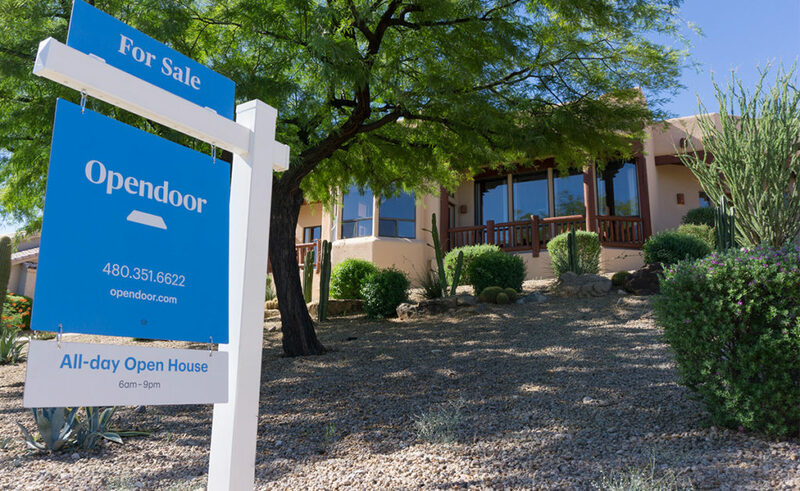 At Opendoor, we recognize that hundreds of factors go into home value and that the market is always changing, so we continually measure the accuracy of our valuations to ensure we’re keeping pace. We regularly compare our valuations of homes to how much they sold for on the market. In cases where there’s a meaningful difference, we analyze why and incorporate those learnings back into our valuation process. It’s important to make the most of your home sale. The price you sell for impacts how much you can spend on your next home as well as the mortgage payments you’ll make for years. That’s why to value your home, we’ve learned from the best practices of real estate professionals and improved upon them with the latest data and technology. → In what cities does Opendoor buy and sell homes?